Right here, this is where I do the cap in hand, grovelling and begrudging admission thing. 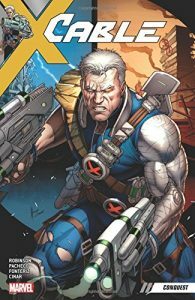 Despite being immersed in Comicsville for the last four decades, I know next to nothing about Cable. And, apart from the fact that he’s a time travelling cybernetic badass and the son of Cyclops, when I say next to nothing, I mean literally nothing. Nada, zilch, zip. Truth be told, Conquest is the first Cable book that I’ve actually read, but having spent a couple of hours with, and witnessing, Nathan Summers laying the smack-down on all manner of villainous types while saving reality, I’m almost certain that it won’t be the last. I got all sorts of lucky with Conquest, as it’s centred on the only aspect of Cable’s character that I was familiar with. Time travel. It’s a familiar tale, one that’s been used in chronal adventures like Time After Time, and while it’s an oldie, the idea of a hero chasing his nemesis through history in order to prevent him forever altering it for his own benefit, it’s also a goodie. Pursuing Conquest, the eponymous arch-baddy of the piece, in order to stop him collecting the five shards of an ancient weapon that can bend and shape time, Cable wages war on his enemies allies in such far flung places as feudal Japan, medieval South America ruled by the Mayans, the Old West and early twentieth century and pre-revolution Russia in an effort to prevent his foe acquiring his goal and subverting and altering history. If that doesn’t sell you on this gritty, action heavy story, then I’ve just got one last thing to say about it that should seal the deal once and for all. Dinosaurs versus tanks in a head-to-head death or glory showdown. Oh yes, that really happens. And it happens in Conquest.